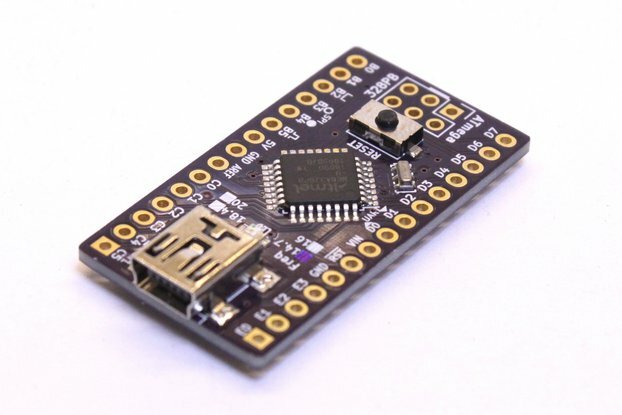 This application board allows the construction of projects based on the ATmega328PB microcontroller which include a digital isolator on the SPI or I²C peripherals. Typically this arrangement is useful when parts of the circuit must be at a different ground potential to the main part containing the microcontroller. Many items of test equipment for example, will often put parts of the analog frontend and a DAC or ADC in such a sub-circuit, separated from the rest of the unit. Such separation is often performed by special-purpose "digital isolator" chips. 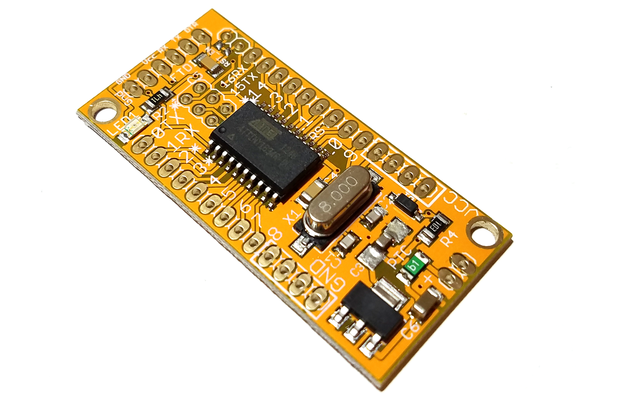 This board provides a handy central piece to such an application, containing the MCU and isolator hardware in one place. 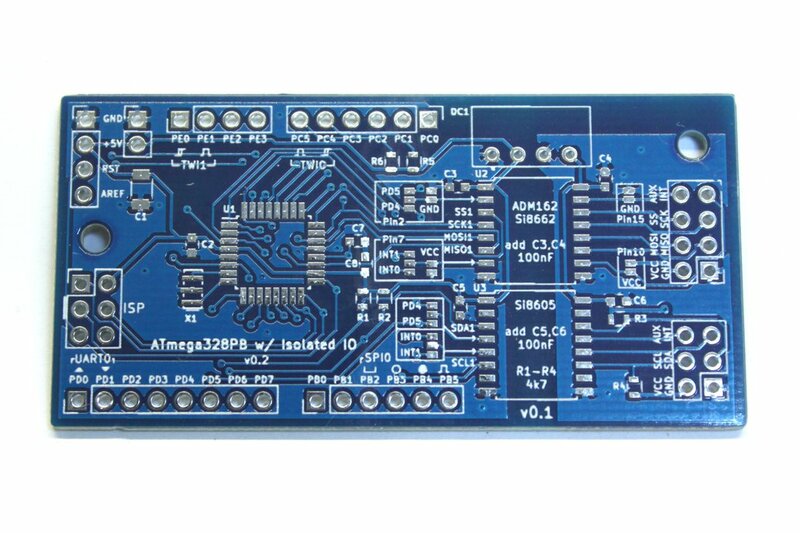 The ATmega328PB at the heart of this board is an expanded version of the popular ATmega328P, familiar to many as the chip on many Arduino boards. 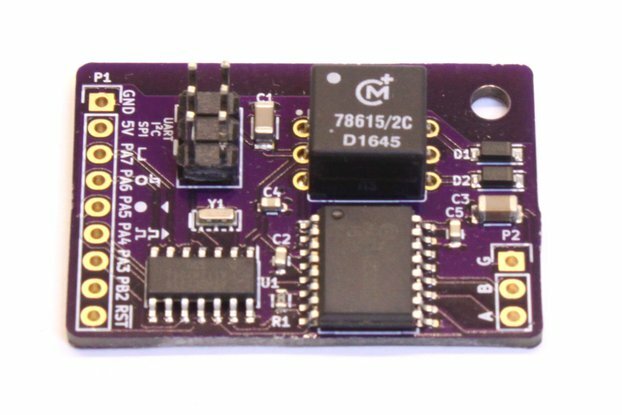 This new PB variant of it adds an additional SPI, TWI and USART module, bringing the chip to a total of two each. Because the chip has two independent SPI and TWI modules, this makes it ideal for isolator applications on this board. One of each module (SPI1 and TWI1) are linked to the isolators for communicating with the isolated part of the circuit, and the other (SPI0 and TWI0) are left available to connect to the non-isolated hardware - typically things like front panel displays or controls, or communications interfaces to other equipment. 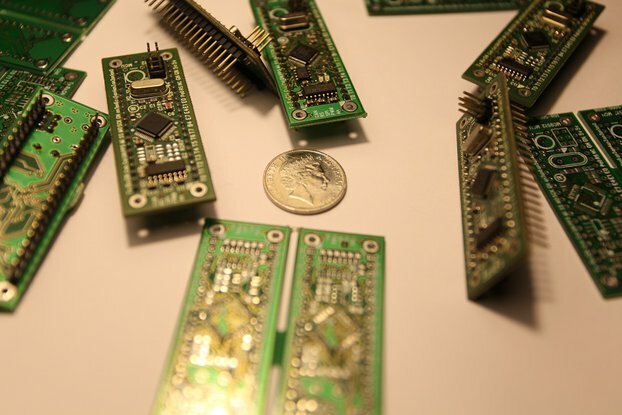 The board has two SOIC16-W sized footprints, which can contain any of a variety of similar isolator chips. The upper chip (U2) is pre-configured to the SPI1 peripheral, isolating the MISO1, MOSI1, SCK1 and SS1# lines onto the remote side. The lower chip (U3) is pre-configured to the TWI1 peripheral, isolating the SDA1 and SCL1 lines to the remote side. Both isolators share a common remote-side power supply, provided by a DC isolator module (in industry-standard 1W SIL footprint). Each isolator slot also has two extra pins available, to make use of spare channels available on some of the choices of isolator chips bringing out extra GPIO lines to the remote side. Each chip allows a choice of PD4 or PD5 to be sent out to the remote device (on a pin labeled "AUX"), and PD2 or PD3 (commonly used for the INT0 and INT1 inputs) to be received from the remote device. Each isolator may be independently wired to either choice of pin, or left unconnected. 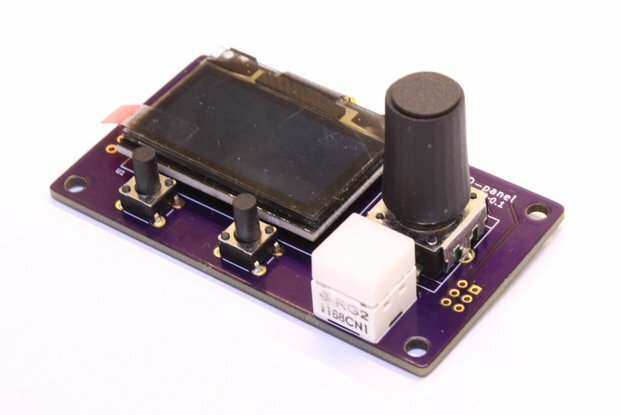 This choice is made by a series of solder jumper pads which can be (re)configured arbitrarily. Note: beware of drive contention if both isolator slots are used, not to have them both driving the same INT line. If both slots are used and both are providing inputs, they must be wired to different interrupt lines. Also note that there is no hi-Z feature provided on the SPI isolator, to release the MISO line on the MCU side when the (isolated) slave is not selected. If using the isolated SPI bus, make sure not to also place other devices on the non-isolated side of it. Use the separate SPI0 peripheral for this instead. The I²C isolator is not affected by similar concerns. Due to the way I²C buses work, it is fine to mix devices on either side of the bus. 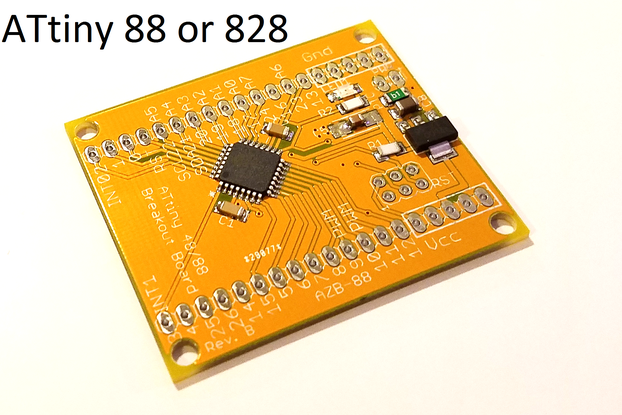 Besides the isolator section and the main ATmega328PB, this board also features breakout pins for all the IO pins of the chip, split by port grouping and labelled with the Atmel standard names for them. The pins relating to UART0, SPI0, TWI0 and TWI1 are also labelled with reference icons as a handy reminder of their functions. Three more headers are provided, one giving ground, power, reset and the ADC reference (AREF), one giving another copy of just ground and power, and the final being the 6-pin AVR ISP header used for programming the MCU. If ordered as a bare board, you will have to populate it. Exactly which isolators you choose to install will depend on the kind of project you are working on, and which communication lines you need on the isolated side. If ordered pre-populated, the board will include the parts suggested below. These isolator chips all come with various channel direction configurations. The above part numbers are chosen for 3 out + 1 in for basic SPI, and an additional 1 out + 1 in for the AUX and INT channels. If you are using this slot for some signals other than SPI, you may need to pick a different channel configuration to suit the directions required.